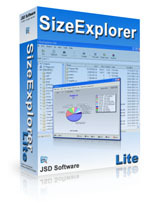 All the information provided by SizeExplorer Lite will help you manage your drives easily. You will be able to rapidly spot large files that may be useless, and you'll have a good general view of the space usage distribution on your drives. If you need these features try SizeExplorer Pro instead of SizeExplorer Lite. work for 21 days. If you like it just purchase the unlimited version.